First concerts are a big deal. When I taught my Youth Subcultures at Portland State, BP (Before Purge), on the first day I’d read the role and ask students to tell the class their first concert. It typically went two ways. You might have some cool obscure punk band or you might have something completely cheesy (a lot of New Kids on the Blocks). There’s also a subcategory called “Christian Rock Fest.” I used it to start a conversation about generational experiences. My first concert locates me in time and space (Elvis Presley, 1973, Atlanta, Age 9, thank you, Mom and Dad). There are also first concerts that you wanted to go to and ones your parents took you to. So Cozy will probably have a concert she will claim as hers sometime around 2028. But I wanted to give her a Point A that she could start from and maybe brag about 50 years from now. I think she’s got it. 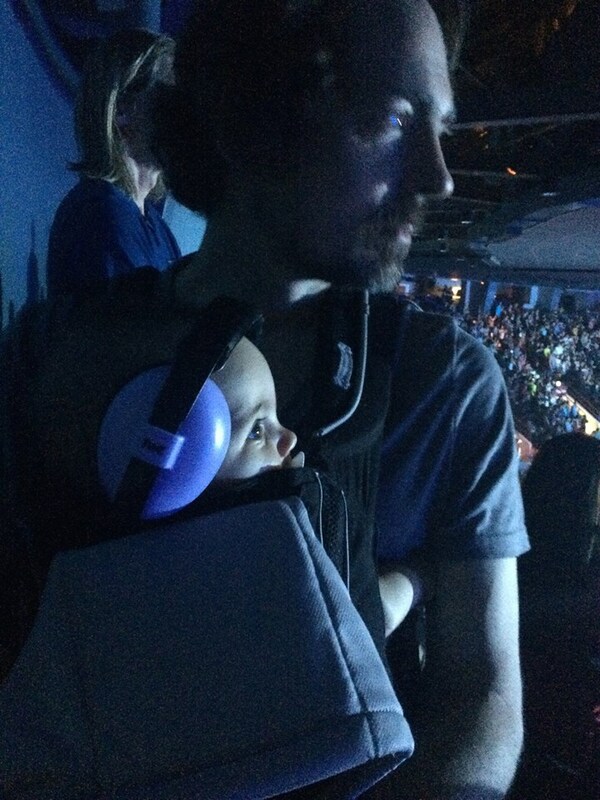 On Friday we took her with us to see U2 in Vancouver, BC. You might know that I have a bit of a history with this band that started when I first saw them play at the Agora Ballroom in 1981. Personal relations aside, a U2 show is always an emotional, exhilarating event. And Andrea had never seen them, so there was no way we were going to miss the northwest stop of the 2015 Innocence and Experience Tour. The original plan was to dump Cozy with a babysitter and make the 5 hour drive up to Canadia. But overnight babysitters are in short supply and the folks at the Rogers Arena said babies don’t need a ticket. (Canadians are so nice.) Andrea made a reservation at an Airbnb and grabbed the passports and I burned a few Alt Latino podcasts for the ride. So with a good set of baby headphones we strapped the kid to the Prius and fled the country. Thanks to the horrid Seattle traffic, I got a little stressed about making the 7:30 show time and brought the fun-level down a bit, but Cozy was fine the whole way up. Gone are the days of getting on U2’s guest list. It’s probably easier these days to get backstage to see the Pope than Bono. So we ended up with tickets in the top row from the evil StubHub. Although, I did bombard U2’s new manager, Guy Oseary, with a bunch of tweets and pictures, including of a letter that Bono wrote me. Top row. But with this stage set up, pretty damn good. Cozy loves a crowd, so her eyes were open wide as we made our way to the seats. On the way, in the ladies room, some middle-aged “lady” with a wine glass and a Coach purse stopped Andrea and asked, “Why did you bring your baby to this?” (Obviously not a Canadian.) Andrea gave her the Mexican finger. But everybody else was charmed by Cozy, as usual. Then the lights went down and the Ramones came on the P.A.and the band took the stage, playing “The Miracle of Joey Ramone.” Crowd goes wild. Cozy, head phones on and in a pouch on my chest, seemed a little freaked out. What’s this craziness? she cried out. By the second song, “Vertigo,” there was a big smile on her face. She loved the colors and vibrations. The staging was massive with a huge screen the band could climb inside of. She was transfixed. The fourth song was “I Will Follow,” from their first album and sounded as explosive as it did when I saw them in 1981. I looked down and Cozy was asleep. She’d wake up every few songs, including for a powerful version of “One” that ended the night. She seemed to love it. She won’t remember any of it, but I will tell her how much she dug it. Of course her parents were blown away. Andrea loved Bono’s tender tribute to his mother, “Iris,” and I was happy to see them play “When Loves Come to Town” for the recently departed B.B. King. The band was tight and grand, tackling issues like AIDS drugs and the unpunished murders of the Irish citizens from the 1972 bombings and then keeping it light by pulling a fan on stage or Bono making jokes about The Edge falling off that stage. There are better reviews of the show. It’s must have been the 25th time I’ve seen the band play live. Maybe 35th. I’ve never missed a tour, even when they opened up for the J.Geils Band on the 1982 October tour. But this one was special. I think Bono would have loved Cozy’s wide eyes at the whole thing. I wanted to just let go of everything throughout the concert. 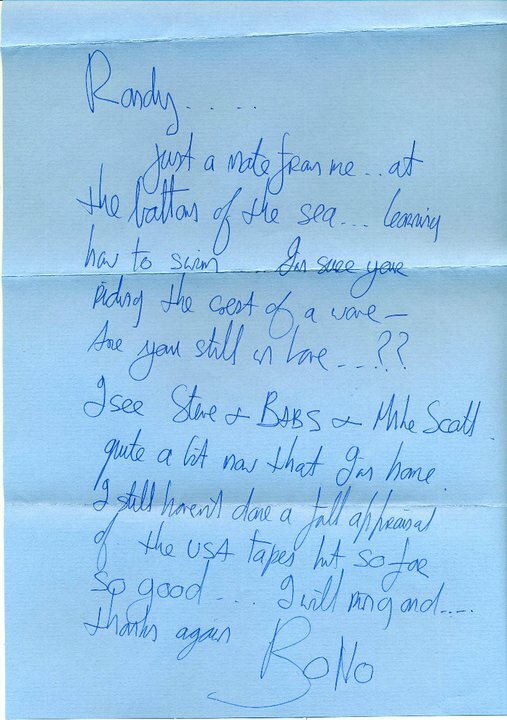 I did during the rare performance of “Bad,” a song I saw take shape in the studio in Dublin in 1984. But I just kept looking at Cozy and imagining her 20 years from now playing the first concert game. Cozy sees U2, 15 May, 2015, Vancouver, BC.